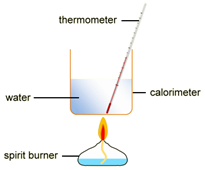 Calorimetry allows for the measurement of the amount of energy transferred in a chemical reaction to be calculated. 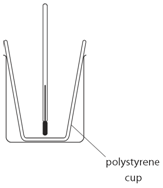 50 cm3 of copper(II) sulfate is measured and transferred into a polystyrene cup. The initial temperature of the copper sulfate solution is measured and recorded. Magnesium is added and the maximum temperature is measured and recorded. The initial mass of the ethanol and spirit burner is measured and recorded. 100cm3 of water is transferred into a copper container and the initial temperature is measured and recorded. The burner is placed under of copper container and then lit. The flame is extinguished and the maximum temperature of the water is measured and recorded.